UR first introduction to the Cuckoo was by means of the apparition which issued hourly from a little German clock, such as are frequently found in country inns. This particular clock had but one dial hand, and the exact time of day could not be determined by it until the appearance of the Cuckoo, who, in a squeaking voice, seemed to announce that it was just one hour later or earlier, as the case might be, than at his last appearance. We were puzzled, and remember fancying that a sun dial, in clear weather, would be far more satisfactory as a time piece. “Coo-coo,” the image repeated, and then retired until the hour hand should summon him once more. To very few people, not students of birds, is the Cuckoo really known. Its evanescent voice is often recognized, but being a solitary wanderer even ornithologists have yet to learn much of its life history. In their habits the American and European Cuckoos are so similar that whatever of poetry and sentiment has been written of them is applicable alike to either. A delightful account of the species may be found in Dixon’s Bird Life, a book of refreshing and original observation. On one occasion Dixon says he heard a Cuckoo calling in treble notes, Cuck oo-oo, cuck-oo-oo, inexpressibly soft and beautiful, notably the latter one. He at first supposed an echo was the cause of these strange notes, the bird being then half a mile away, but he satisfied himself that this was not the case, as the bird came and alighted on a noble oak a few yards from him and repeated the notes. The Cuckoo utters his notes as he flies, but only, as a rule, when a few yards from the place on which he intends alighting. The opinion is held by some observers that Nature has not intended the Cuckoo to build a nest, but influences it to lay its eggs in the nests of other birds, and intrust its young to the care of those species best adapted to bring them to maturity. But the American species does build a nest, and rears its young, though Audubon gives it a bad character, saying: “It robs smaller birds of their eggs.” It does not deserve the censure it has received, however, and it is useful in many ways. Its hatred of the worm is intense, destroying many more than it can eat. So thoroughly does it do its work, that orchards, which three years ago, were almost leafless, the trunks even being covered by slippery webbing, are again yielding a good crop. Nature Study Pub. Co., 1897, Chicago. Range—Eastern North America to British Provinces, west to Great Plains, south in winter, West Indies and Costa Rica. Nest—In low tree or bush, of dried sticks, bark strips and catkins. Eggs—Two to four; of glaucous green which fades on exposure to the light. 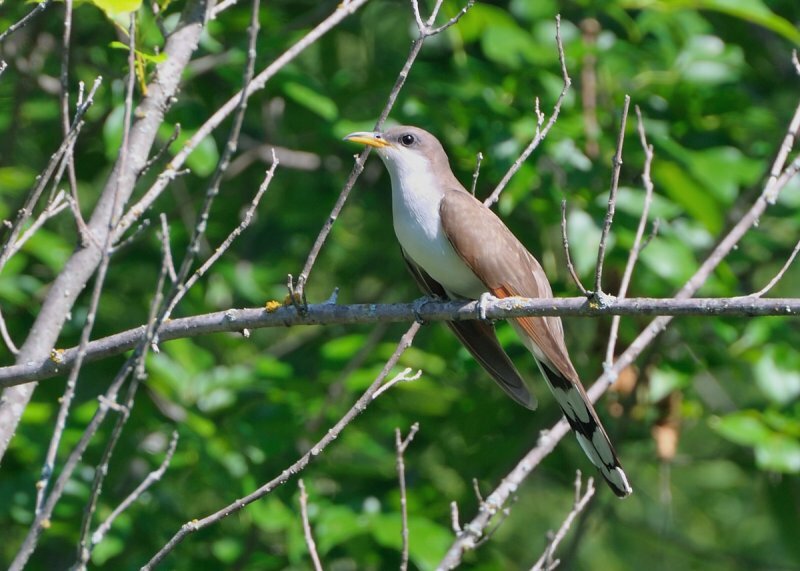 The Yellow-billed Cuckoo (Coccyzus americanus) is a cuckoo. Common folk-names for this bird in the southern United States are Rain Crow and Storm Crow. These likely refer to the bird’s habit of calling on hot days, often presaging thunderstorms. Adults have a long tail, brown above and black-and-white below, and a black curved bill with yellow especially on the lower mandible. The head and upper parts are brown and the underparts are white. There is a yellow ring around the eye. It shows cinnamon on the wings in flight. Juveniles are similar, but the black on the undertail is replaced by gray. This bird has a number of calls; the most common is a rapid ka ka ka ka ka kow kow kow. 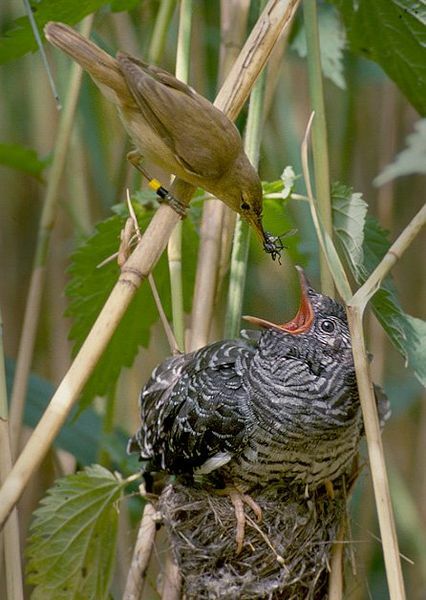 The cuckoos are a family, Cuculidae, of near passerine birds. The order Cuculiformes, in addition to the cuckoos, also includes the turacos (family Musophagidae, sometimes treated as a separate order, Musophagiformes). Some zoologists and taxonomists have also included the unique Hoatzin in the Cuculiformes, but its taxonomy remains in dispute. The cuckoo family, in addition to those species named as such, also includes the roadrunners, koels, malkohas, couas, coucals and anis. The coucals and anis are sometimes separated as distinct families, the Centropodidae and Crotophagidae respectively. The cuckoos are generally medium sized slender birds. The majority are arboreal, with a sizeable minority that are terrestrial. The family has a cosmopolitan distribution, with the majority of species being tropical. Some species are migratory. The cuckoos feed on insects, insect larvae and a variety of other animals, as well as fruit. Many species are brood parasites, laying their eggs in the nests of other species, but the majority of species raise their own young. Aren’t birds amazing? I always enjoy finding out more of the Lord’s fantastic creation. Yellow-billed Cuckoos occasionally lay eggs in the nests of other birds (most often the closely related Black-billed Cuckoo), but they are not obligate brood parasites of other birds as is the Common Cuckoo of Eurasia. 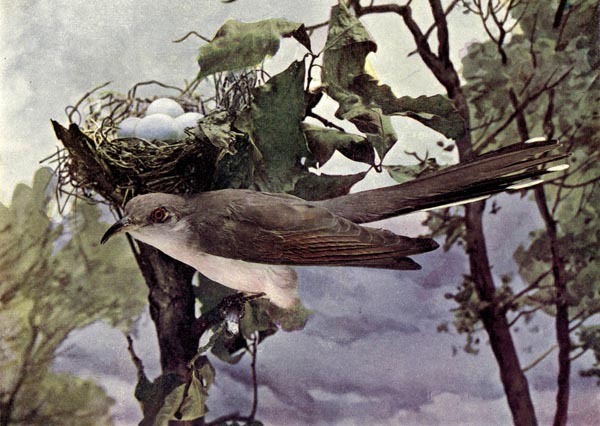 This entry was posted in Birds, Birdwatching, Christian, From The Past and tagged Birds Illustrated by Color Photography, Creation, Cuculidae, Cuculiformes, Home School, Kids, Nature, Photography, Yellow-billed Cuckoo, Youth. Bookmark the permalink.